Once Hauppauge Capture is downloaded, run the Hauppauge Capture installation. Normally, you will find the file in your 'Downloads' folder. The HD PVR 2 and Colossus 2 Logo Inserter puts a graphic in your recordings or video streams. It does this automatically, branding your videos and streams with your logo. In the TV industry, an on-screen logo is called a 'digital onscreen graphic' or 'TV bug', and you can often see this in the lower right hand corner of news programs on TV. The Hauppauge Personal Logo application uses the Logo Inserter, and is part of the Hauppauge Capture application (it can be found in the Settings tab). There is also a standalone version which is installed with the HD PVR 2 Installation package. Click on the download link. You will be given an option to Run or Save the file. Click Save to save the file in your Download folder. When finished running the update, you will be ask to restart your PC. Restart your PC. While the PC is restarting, power cycle your HD PVR 2 to load the new firmware. To power cycle the HD PVR 2, remove power from the unit for a few seconds and then plug it back in. When your PC has rebooted, you should see the Hauppauge Capture icon on your Windows desktop. Double click on the Hauppauge Capture icon. Note: You will not see video on your TV set until you run Hauppauge Capture once. If your cables are connected, you should now be able to see your game console on your TV set and record and stream your gameplay. This version has a fix for an Error code 52 found with some versions of Windows. Click the file to install. Note: this is a stand alone version of StreamEez. 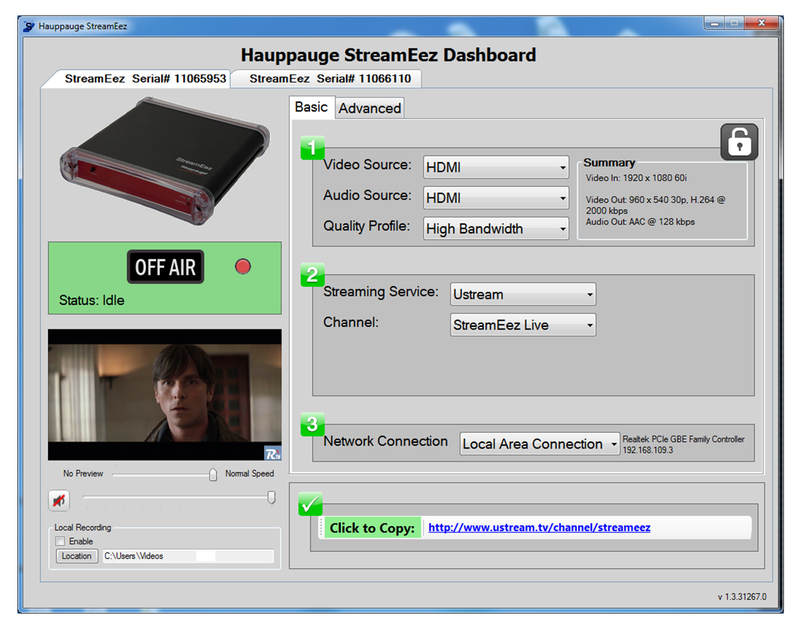 You can also use StreamEez as part of the Hauppauge Capture application. Run this file. It will install the StreamEez-Pro application plus the Windows driver. While the PC is restarting, power cycle your StreamEez device to load the new firmware (remove power from the unit for a few seconds and then plug it back in). When your PC has rebooted, double click on the StreamEez-Pro icon. Under Source (upper left hand corner), make sure it is set to your Hauppauge device. If your cables are connected, you should now be able to stream with Twitch or YouTube. Before you change any settings, make sure you are Off Air and the Lock button is unlocked (just click on the button to unlock). Choose your Video Source. Xbox 360 normally uses HDMI while PS3 normally uses Component. Choose your Audio Source. Xbox 360 normally uses HDMI while PS3 normally uses Line. In Quality Profile, the default is High Bandwidth. Depending upon the uplink speed of your Internet service, you may need to change to Medium or Low bandwidth. A laggy or jerky stream means your uplink speed is too low and you need to choose a different Quality Profile. If you would like to preview your video in StreamEez, make sure the slider under the preview window is set to 'Normal speed'. You should now see your video in the preview window. In Channel, select Login. Enter your Login and Password. You will see a message "Gathering credentials" as we check your user name and password. Once your user name and password are confirmed, you will see the URL of your stream in the box "Copy stream link". If you click on the words "Copy stream link", the URL will be copied to the clip board. To start streaming, click the red dot next to "Off Air." The indicator should be changed to "On Air" and you will now be streaming live over the Internet! Once you are On Air, you cannot change any settings. You need to stop streaming by clicking the green dot next to On Air to stop the stream. Note: WinTV v8 is a TV watching, pausing and recording application. It is provided with the HD PVR 2 model 1512 only. All other versions of HD PVR 2 can be used with WinTV v8 but require a separate purchase. You can purchase WinTV v8 for the HD PVR 2 here. Capture4ME is compatible with HD PVR 2. It is an easy-to-use application that focuses on the core goal of capturing video. The Capture4ME app has the ability to trim the beginning or end of a recording, and also an 'Upload to YouTube' function for those that want to share their videos online. The HD PVR will only work with 480p, 720p, 1080i and 1080p. If your system is currently set to non-standard resolutions, such as 1360x768, please select 480p, 720p, 1080i or 1080p. Note: HD PVR 2 can accept video from a PC in the following formats ONLY: 1920 x 1080 at 60Hz max, 1280 x 720 at 60 Hz max and 720 x 480 at 60 Hz max. If you are running in any other video mode, you will see either a black screen or distorted video. Check your video mode! Note: if you do not have audio in your recordings, please refer to Steps 4 and 4a. When using HDMI Output on a PC, audio can go to either the HDMI connector or the Speaker output. If you do not have audio in your recordings, then audio is going from the wrong place on your PC. Connect the HD PVR 2 to your PC (the PC where you will be recording) using the supplied USB cable. Connect the power to the HD PVR 2. Install Hauppauge Capture from this Support page in the Capture tab. When you are finished with the installation, you will need to reboot your PC. While your PC is rebooting, power cycle the HD PVR 2 by removing the power connector for a few seconds. After you reboot, run Hauppauge Capture by double clicking on the icon on your Windows desktop. At this point you might not see video in the Capture preview window. This is normal. If you are running in any other video mode, you will see either a black screen or distorted video. Check your video mode! 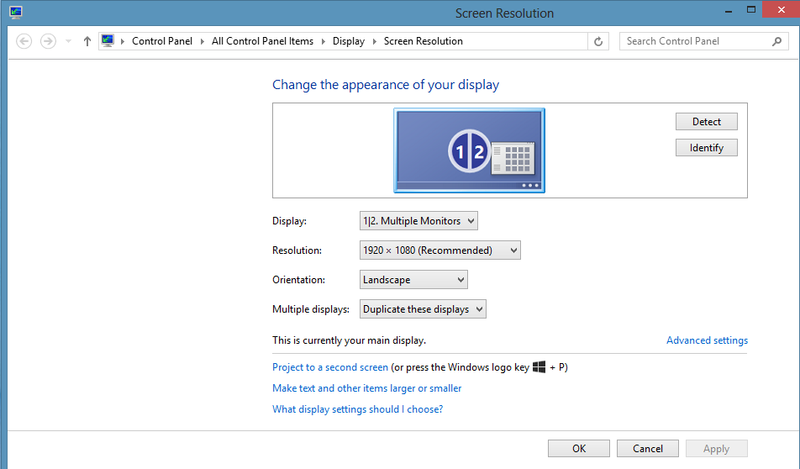 Screen resolution menu on your Windows PC. 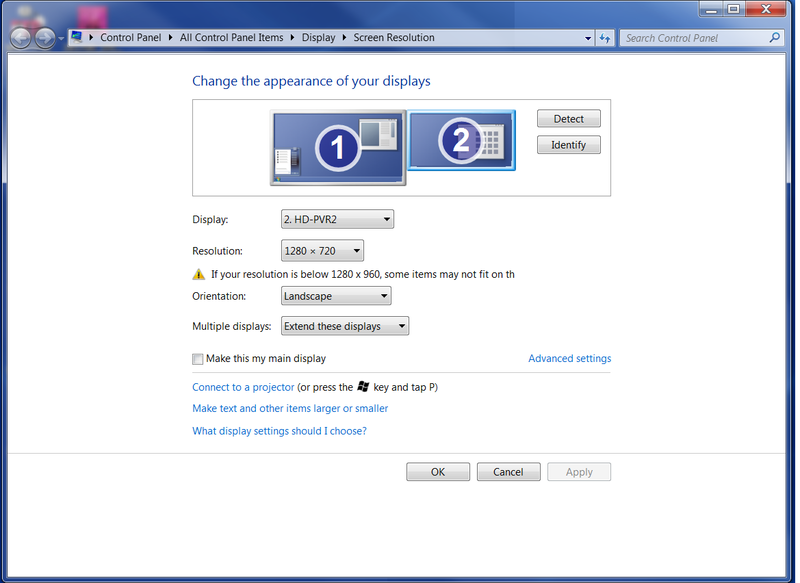 The Resolution must be set to either 1920X1080 or 1280X720. On the computer where you will be playing your video games (we'll call this the Gaming PC), connect an HDMI cable from your graphics card HDMI port to the HDMI in on the HD PVR. Note: your Gaming PC screen may go black for several seconds and then you will be back at the Windows desktop. Under Display you should see your HD PVR model in the drop down menu. Example: HD PVR 2. Select your HD PVR recorder (click for screen shot). Under Resolution, set to either 1920X1080 or 1280X720. Under Multiple displays, set to Duplicate these displays. Click Advanced settings (click for screen shot). Set Refresh Rate to 60p Hz Set Scaling to Maintain Display Scaling. If you have a gaming laptop, simply plug an HDMI cable from your laptops' HDMI out port into the HDMI In on the HD PVR. You should see your PC screen on the video monitor. If you do not, click the Windows button on your keyboard and at the same time the P key. Then select Duplicate. 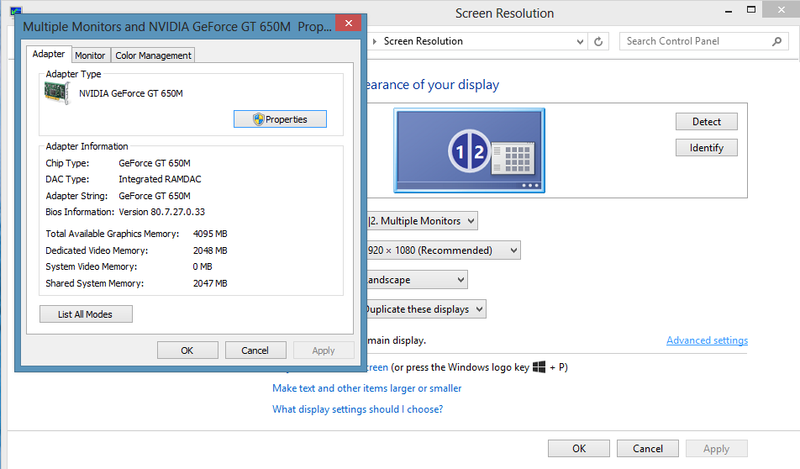 If you have set your PC's video mode correctly (step 2 above), you should see your PC screen on the video monitor. If you have a desktop PC, then remove the HDMI cable which is plugged into the monitor and plug it into the HDMI In port on the HD PVR. Then take an HDMI cable and plug one end into the HDMI Out port on the HD PVR and the other end into an HDMI port on your monitor. If you have set your PC's video mode correctly (step 2 above), and you have selected the correct HDMI source on your TV set, you should see your PC screen on the video monitor. Recording from a PC? Here's how to set the audio. If you are using the HDMI pass through on the HD PVR (if you are not using HDMI pass-through skip to step 4a), on your Gaming PC right click on the Speaker icon on the taskbar and select Playback device. In Playback devices find your HDMI connection to the HD PVR (it should say HD-PVR2, HD PVR Rocket or sometimes Digital audio (HDMI)). Right click and select Set as default device. If you are listening to sound from your Gaming PC through speakers and not on your video monitor, to hear audio without any audio delay you will need to split the audio coming from your Gaming PC. 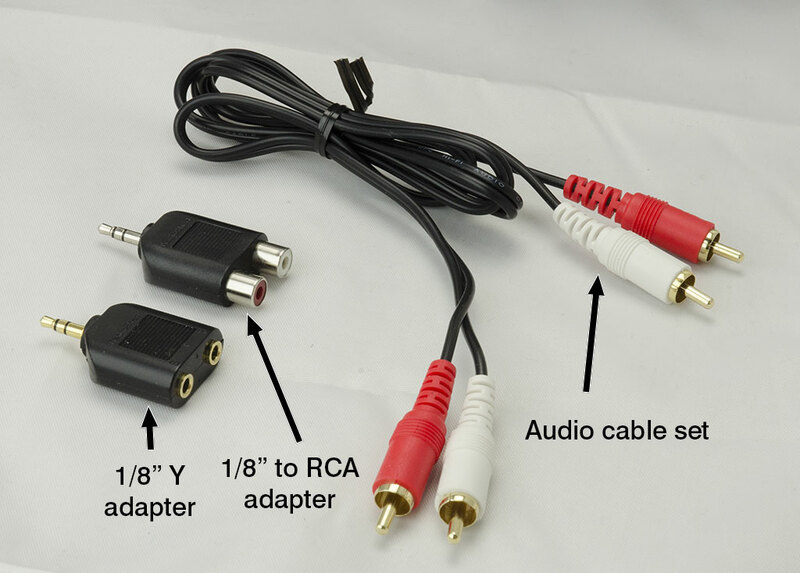 To do this, you will need two adapters: an 1/8th inch stereo Y adapter, a 1/8th inch stereo to RCA male adapter.and an Audio cable set. These adapters are common and can be purchased from Radio Shack or online. Connect the 1/8" stereo 'Y' adapter to the green audio port (the audio out port) on your Gaming PC. Plug your speaker cable into one end of the 1/8" stereo 'Y' adapter. Then plug the other end of the Audio cable set into the back of the HD PVR via the Hauppauge AV adapter cable (the audio jacks). In Hauppauge Capture, in the Capture or StreamEez tab, set Audio in to Line in and mute the audio (so you will not hear an audio echo). List All Modes menu. Set the screen resolution to 1920 by 1080, True Color (32-bit), 60Hz. Then click OK / OK and Apply. HD PVR 2 Gaming Edition has video pass through for no delay recordings. Simply connect HD PVR 2 between your game console and your HD TV set. What Operating Systems are supported by the HD PVR 2 and Colossus 2? Microsoft Windows 10, 8, 8.1, Windows 7 or Vista (32 or 64-bit), or Windows XP with Service Pack 2 or later. There is also new Linux support for the HD PVR 2 and Colossus 2. Do I need a PC to use HD PVR 2? Yes, a PC or laptop is required to use HD PVR 2. The PC is used to both run the HD PVR 2 application plus is the place where HD PVR 2 recordings are stored. HD PVR 2 does not have any internal disk storage. HD PVR 2 connects to a PC or laptop computer through a USB 2.0 port. The HD PVR 2 recordings are stored on the PC's disk drive. If you want to record your HD videos without a PC, you should use the HD PVR Rocket. If you have a Mac, there is an application from HDPVRCapture which can be used. Go to http://www.hdpvrcapture.com for more information. I use the HD PVR 2 Gaming Edition. I was wondering how do I record my commentary with game audio? With the Hauppauge Capture application, you can plug your microphone into the 'mic input' on your PC. Hauppauge Capture will mix your game play audio with microphone audio. With Hauppauge Capture, there are seperate volume adjustments for game play and microphone audio. You can also add PC sound (music or Skype audio) to mix together PC audio with game audio and your game commentary. 2. Go along to settings. 4. Go down to voice output and select 'Play though both'. This will make the audio play out your TV and through your mic at the same time. I am getting squeaky audio when I record game commentary with my microphone. How can I fix this? On your PC, go to the speaker icon on the right side of your desktop's toolbar, right-click the speaker icon and select "Recording devices". Then in the new window that opens, locate your microphone and the right-click it in the list and select the option "Properties". A new window called "Microphone Properties" will open. Go to the "Advanced" tab. There you'll see a section named "Default Format", click the drop down menu and select this from the list: 2 channel, 16 bit, 48000 Hz (DVD Quality). Then click apply, restart your PC and give the recording another try. Can I record composite video or S-Video? Yes. To record composite video with the HD PVR 2 or Colossus 2, simply connect the yellow connector from your video source to the blue connector on the Hauppauge AV cable. Then, in Hauppauge Capture, set the Video Source to Composite. For S-Video, you will need to use the optional Hauppauge AV cable model 6021252 which you get purchase on the Hauppauge Webstore. Hauppauge Capture has a setting for S-Video. Recordings from composite or S-Video are still made in the H.264 format. Can I connect the HD PVR 2 passthrough cable to a standard TV? No. The HDMI output of the HD PVR 2 can only be used on an TV set with HDMI connectors. HDMI TV sets normally display 720p or 1080p video. Can I use HD PVR 2 with a Mac? If you buy the HD PVR 2 Gaming Edition Plus, it comes with a free copy of Capture for the Mac. Hauppauge Capture uses any webcam, either HD or standard definition, as long as it has a 'raw' YUV or YUY2 mode. MJPEG and other compressed formats are not used. Your webcam can be 4:3 or 16:9. Popular webcams include the Microsoft Lifecam HD-3000 plus, if you have a laptop, the built-in webcam. You can record HD PVR 2 video on pretty much any PC. 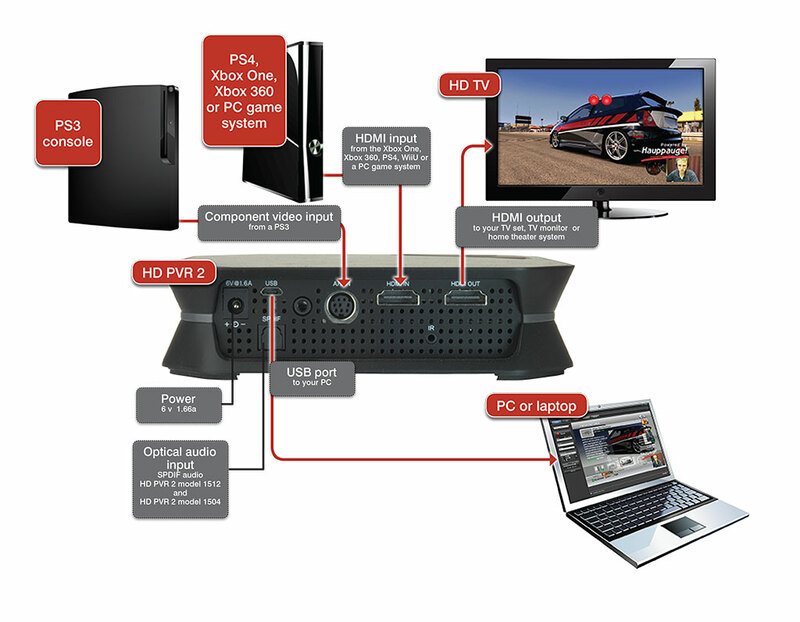 Older, slow, laptop or desktop PCs can be used to record HD PVR 2 video. Preview video on older PCs and laptops might be jerky and laggy but your recordings will be fine. Can I record video from my old Nintendo, PS2 or Wii? Yes. Connect the yellow cable from your console (Nintendo, PS2, Wii or any other game console which has a yellow composite video connector) to the Blue connector on the Hauppauge AV cable. Then connect the red and white audio cables from your Wii to the red and white connectors on the Hauppauge AV cable. Then, in Hauppauge Capture or Hauppauge Capture, select Composite under Video input and Line In under Audio input. Would you like to support the HD PVR 2 in your own Windows application? You can access the HD PVR 2 in your DirectShow application. Simply build a Directshow graph and add the crossbar, capture and encoder filters. Then connect them all up, and it'll output a transport stream containing H.264. You can then demultiplex it or do whatever you want to it. And you can use standard Microsoft API like IVideoEncoder to control the bitrate. Here is a link to the Graphedit graph. Can I use the HD PVR 2 with Linux? http://www.hauppauge.com/linux in the HD PVR 2 for Ubuntu section. Can I use HD PVR 2 with the Hauppauge WinTV v8 or WinTV v7 application? Yes. WinTV v8, WinTV v7 and WinTV v 7.2 are compatible with all models of the HD PVR 2. Can I record high definition TV from a Cable TV or Satellite box or DVR? If your satellite or cable box or DVR has Component Video connections on the back of the receiver (normally Red/Green/Blue or marked YPrPb), then the answer is "yes". By connecting the Component video output from your high definition cable TV or satellite TV set top box to the Component video inputs of the HD PVR 2, you will be able to record the TV programs coming from your set top box to the hard disk. Component video connections are normally the Red/Green/Blue connectors on the back of a set top box. Sometimes they are also called YPrPb or YCrCb connectors. Note: HD PVR 2 model 1512 comes with the cables to connect to your satellite or cable TV set top box. What type of recordings can I make with the HD PVR 2? HD PVR 2 encodes in an H.264 format. It records in TS or M2TS file formats, which is a basic H.264 'transport stream'. Many people would like to know if the quality of a TS or M2TS recording is as good as an MP4 recording. The video quality of MP4 and TS files are the same. The primary difference between TS and MP4 files is that TS files are flat while MP4 files have an index at the beginning of the MP4 file. Otherwise, the video bits inside the files are the same and therefore the video quality of TS, M2TS and MP4 files are the same. All record file types can be used to burn AVCHD Blu-ray compatible discs but you will need to supply your own disc burning application. What type of audio encoding is made with the HD PVR 2? There are two ways of bringing audio into HD PVR 2: through the Line In (RCA) stereo audio jacks on the A/V connector or through the HDMI connector. When bringing audio in through the stereo jacks, audio is recorded as MPEG 1 layer 2 audio. When bringing audio in through the HDMI connector, the audio is also recorded in the MPEG 1 layer 2 format. If you have the HD PVR 2 model 1512 or the HD PVR 2 Gaming Edition Plus and are bringing in 5.1 channel audio from either HDMI or optical audio, your recordings will be made with 5.1 channel AC-3 audio. Can I output files I've recorded with my HD PVR 2 or other content from my PC back to an external TV monitor through the HDMI outputs on the HD PVR 2? No, the HD PVR 2 itself does not have the ability to play back recorded videos to an external monitor. To playback recorded videos, you will need to connect your laptop or PC to your TV set. The HDMI video output on HD PVR 2 acts as a pass through for live video streaming from your video source through the HD PVR 2 back to your TV monitor. The power of the HD PVR must remain in the on position in order to pass the video through to the external TV. If I record my game play, can I uploaded it to YouTube? Yes. Recordings made with HD PVR 2 are either in TS, M2TS or MP4 formats, which can be immediately uploaded to YouTube without conversion. Hauppauge Capture records from HD PVR 2 in an H.264 form which is used by YouTube. And the Hauppauge Capture Edit tab allows you to trim your videos very quickly without the need to re-encode. I'm streaming my gameplay with YouTube, but I cannot get YouTube to record the videos. What am I doing wrong? YouTube will not record your video streams unless you set a start time and an end time in your streams. If you simply start and stop a YouTube stream, YouTube will not record it. Can my PC go into hibernate or sleep mode when using HD PVR 2? The current Windows driver for HD PVR 2 does not allow your PC to go into Hibernate or Standby mode when it is either recording or previewing video. Can I record my webcam while recording and streaming with the HD PVR 2? Yes for recording, no for streaming. With the latest version of Hauppauge Capture, you can record your videos with a webcam in your recordings. This is called the 'Facecam' feature in Hauppauge Capture. Facecam allows you to specify the location and size of video from your webcam in your recordings. I'm using a PS3 and I see a black preview screen in Hauppauge Capture. How can I fix this? 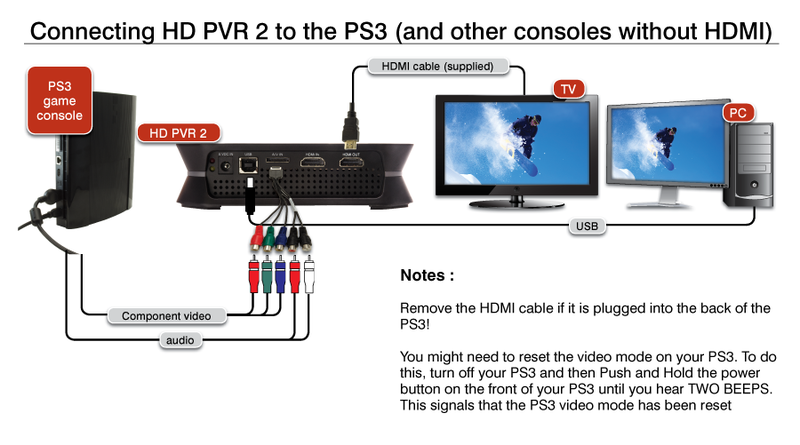 This happens if you connected your PS3 using HDMI and now want to use Component video so you can record with HD PVR 2. - Then push the PS3 power button on the front of the PS3. You should see the light go Red. This means your PS3 is turned off. - Then hold down the PS3's power button until you hear two beeps (one beep, then about 5 seconds and a second beep). Your PS3 should now be set to Component video out and you should see video in the preview window in Hauppauge Capture. I'm using a PS3, and the video in the Hauppauge Capture preview window has incorrect colors? Most of the time this is caused by either one of the Component video connectors is not connected. For example, if the Red connector is not connected correctly, your video picture will look green. Also try updating to the latest drivers supplied by your graphics card manufacturer. I see a change in brightness every few seconds in Hauppauge Capture and Hauppauge Capture while recording, streaming or playing back my video recordings. But my recordings are fine. What is going on? 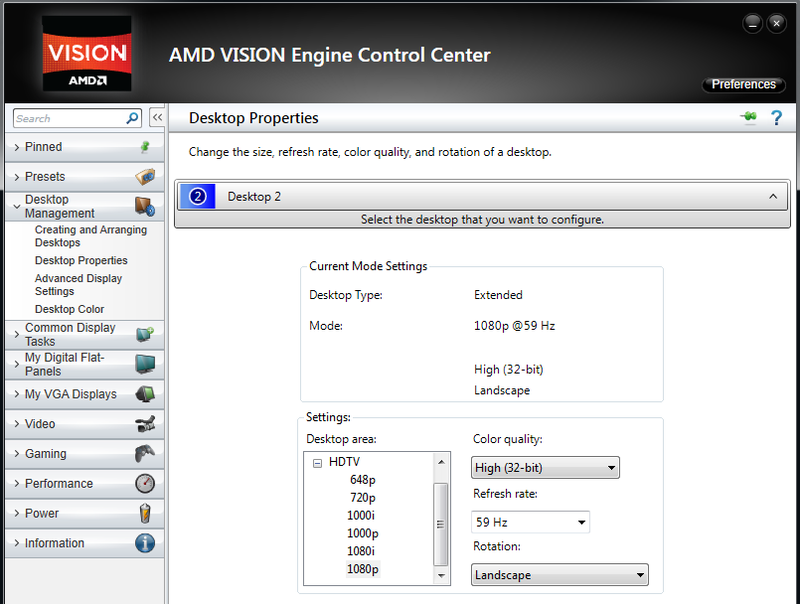 If you are running an AMD graphics card in the PC which the HD PVR 2 is connected to, you may experience a slight change in brightness every few seconds while in the preview or edit screens. This is due to an issue with hardware acceleration that we have seen in some AMD drivers. This shift does not affect recordings and typically can be eliminated by either changing drivers for the graphics card or by disabling Hardware acceleration. Video is jerky or broken up while capturing, yet my recordings are perfect. Why? This is caused by either a slow processor in your laptop or desktop PC, or the display adapter is having a problem. Make sure your video card meets the minimum requirements. Also try updating to the latest drivers supplied by the manufacturer. In September 2012, there was a problem with the ATI graphics driver which would cause jerky video or freezing of the video screen. This should be fixed with an update from ATI on their graphics drivers. I get a black screen in the preview window when using Component video from a cable TV set top box. Some set top boxes will disable or turn off the component output if the HDMI or DVI output is being used. Check to see how you have your Television connected to your set top box. You might need to disconnect the HDMI connector on your set top box when you want to record TV programs. In order for the audio pass through to operate, you need to configure the Audio settings in the Hauppauge Capture application. Click on the Capture tab. 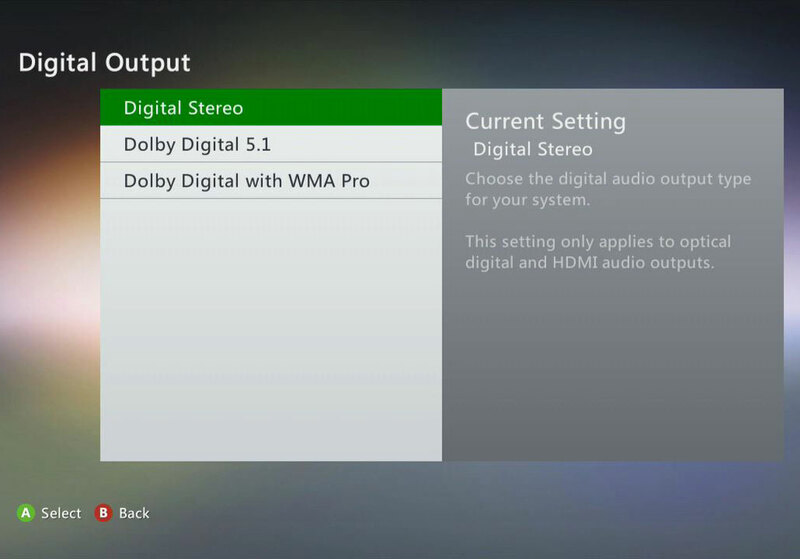 In the Audio input section, choose your audio source from the drop down menu ( RCA, HDMI ). Once configured, the HD PVR 2 will retain these settings. Note: the HD PVR 2 must be powered on for the pass through to operate. My video recordings look pixelated with fast motion. What can I do? Increasing the recording bitrate will eliminate motion artifacts in your recordings. In Haupauge Capture, in the Capture tab make sure Variable is selected. Than start with Quality set to 11 Mbits/sec. This should give you very good quality. You can continue to increase the Quality up to a maximum of 14 Mbists/sec. You can experiment with other settings, but in our experience, these are good for uploading to YouTube. What resolutions and bit rates are supported using the HD PVR 2? Video record resolutions are 1080p30, 720p60, 540p60, 480p60 and a number of downscale variants of these formats. You can record at datarates from 1Mbs to 13.5Mbs. If you choose Variable, the maximum recording datarate is about 1.5 times the selected rate. As an example, if you have Variable selected and set the Quality to 14Mbits/sec, the maximum rate will be about 21 Mbits/sec. What file formats are created by recording with the HD PVR 2? Hauppauge Capture records in a TS file or M2TS file directly. TS is also called 'AVCHD' and is the native format for Blu-ray DVD discs. Also, Hauppauge Capture has an Export to MP4 function, which adds an index to the beginning of a TS recording and creates an MP4 file. This usually takes just a few seconds and does not change the video quality of your recording. Approximately 2 GB per hour at 5Mb/s setting. Approximately 4 GB per hour at 9Mb/s setting. Approximately 6 GB per hour at 13.5 Mb/s setting. Can I use HD PVR 2 independently from a PC? No, the HD PVR 2 requires a PC to operate. If you want to record without a PC, you should use the HD PVR Rocket. If you are using the HD PVR 2, once you have connected your PC to HD PVR 2 and run Hauppauge Capture, you can disconnect the USB cable to your PC and the passthrough will continue to run as long as HD PVR 2 still has power. Can I use a longer USB cable with my HD PVR 2? It is not recommended to use a longer USB cable other than the 2 meter USB cable provided with the device. Can I burn a Blu-ray disc with my HD PVR 2? You can burn Blu-ray compatible discs, but a disc burner is not supplied with HD PVR 2. What are the specifications for the power adapter that is included with the HD PVR 2? The power adapter is 6V 1.6 amps. Hauppauge Capture hangs during the installation. What can I do? Check for the presence of "Constant Guard" from Exfinity. If present, uninstall it, then re-run the installation for Hauppauge Capture. Once installed you can reinstall Constant Guard. How can I record party chat from the Xbox One? "With the Xbox One, to record game commentary I do this: in Kinect settings, use the Kinect mic which forces the party chat to come out of the TV speakers. The Hauppauge game recorder will then pick up the party chat when recording game audio. In order to record your voice (which won't come through the speakers and be picked up), you need to have a Mic plugged in to your PC and place near your face as you do. Then make sure in Hauppauge Capture you select the mic in the drop down menu and set level. 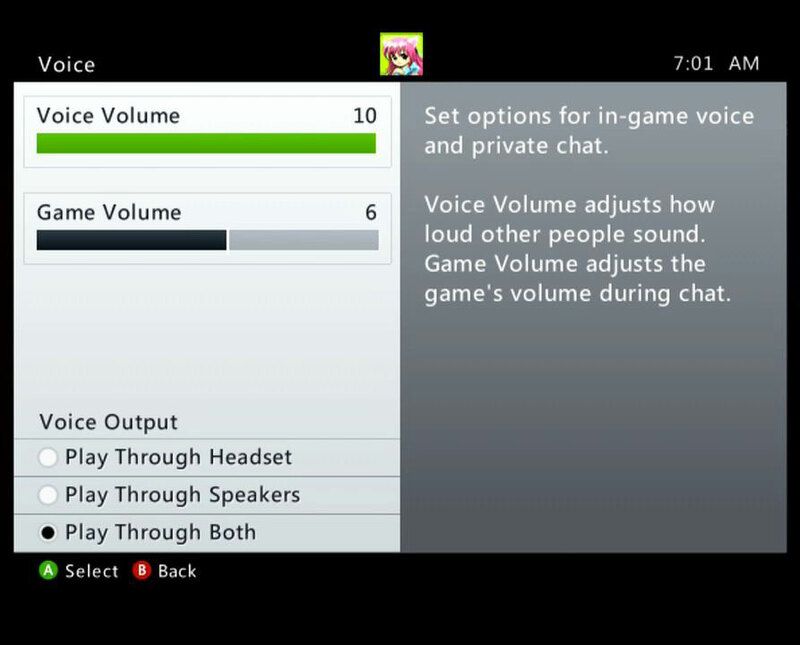 Then you will get the game chat and the game audio recorded, and you speak to your party via Kinect microphone. Basically, one mic to chat with your party and one mic to record your game commentary." How can I restart Device Central? HD PVR 2 can adjust the color settings of both the recordings and the passthrough video. To adjust the color settings, open Hauppauge Capture and go to the Capture tab. Then click the Advanced button at the bottom and go to Video Proc Amp. Here you will see the color and briteness settings. 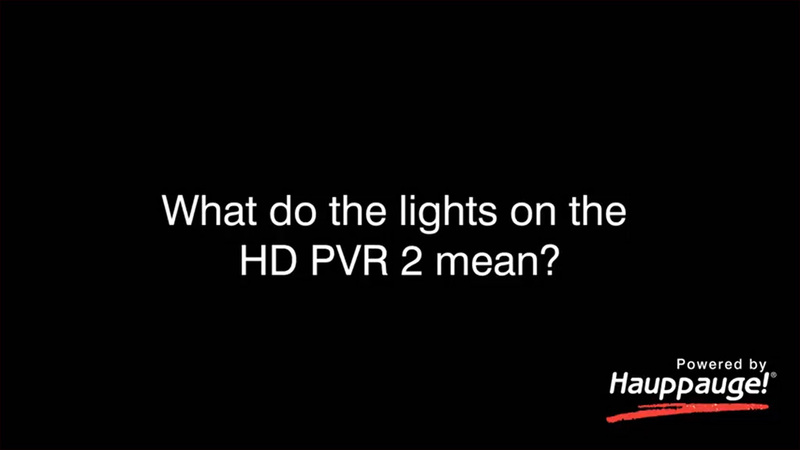 What do the lights on front of HD PVR 2 mean? Blue light: When HD PVR 2 is powered on and the Windows driver is running, the blue light is on solid. When the blue light is blinking, the HD PVR 2 is not 'seen' by your PC. Check the USB cable! You did not plug in a video cable, or you have the wrong video source selected in Hauppauge Capture. In the Capture tab, make sure Video input is set correctly: HDMI or Component video. And check your video cable and your cable connections! If you have a bad cable or have made a mistake plugging in the cables, you will see a Blue light. 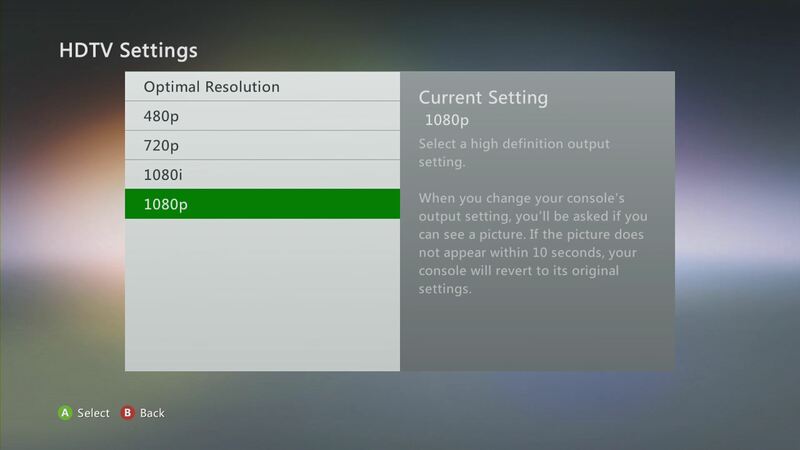 If you are recording from an Xbox 360, make sure your video mode is set to either 1080p or 720p. Here is where you can find instructions on setting your video mode. 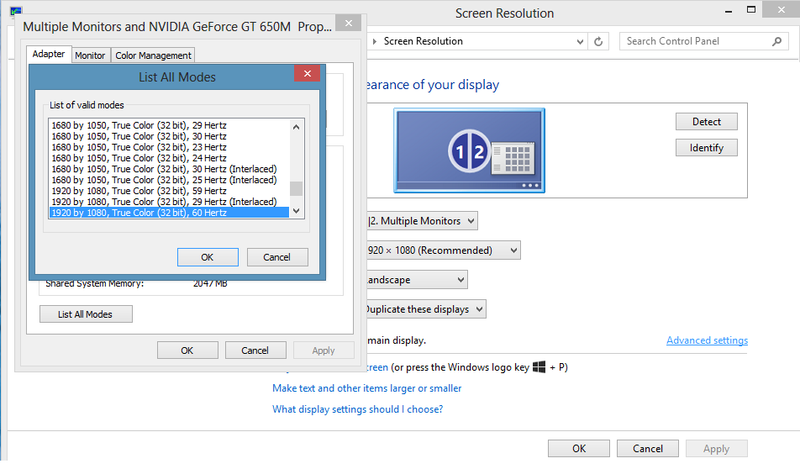 If you are recording from a PC game system, make sure you have set your PC graphics video mode to 1080p at 60Hz. 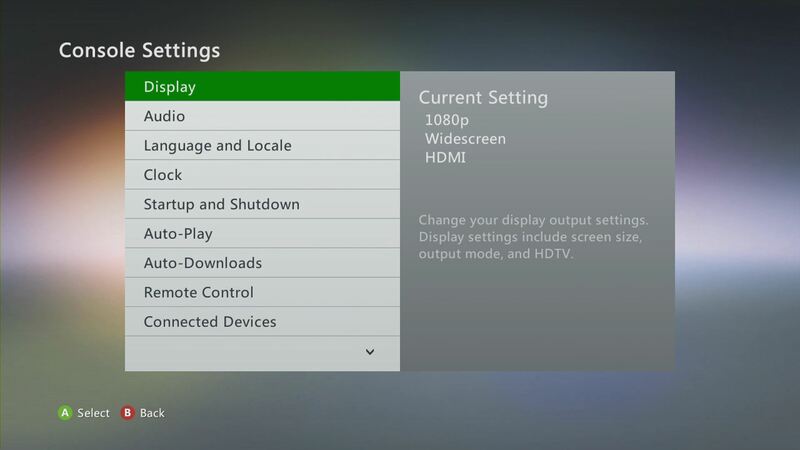 Here is where you can find instructions on setting your PC video mode. Green or Blue LED ring: indicates that HD PVR 2 is recording video. Red light: this means the video encoder inside HD PVR 2 cannot send data to your PC. There are a number of reasons this could happen. If your PC is running slowly and cannot get data from HD PVR 2 quickly enough, the red light might go on for a few seconds until the PC can accept data. If there is a problem with your USB cable or the USB port on your PC, the red light might be illuminated. Change to another USB port on your PC, then power down HD PVR 2, wait a few seconds and power up again. If you continue to see the Red light while recording, check your cabling and if you continue to have problems, contact Hauppauge technical support. If you are using Windows 10, make sure you have downloaded and installed the latest version of Hauppauge Capture. A recent Windows 10 update changed Privacy settings and requires the latest Hauppauge Capture to fix this message. If you are using Hauppauge Capture, this error is normally caused if you did not fully install Hauppauge Capture or something such as anti-virus software prevented Hauppauge Capture from installing. Please go to the Hauppauge Capture download page and follow the installation instructions once more. Note: make sure you remove the power plug on the HD PVR 2 for a few seconds after installing a new version of Hauppauge Capture. This resets the HD PVR 2 and gets it ready for the new application. First, make sure, in the Capture tab: if you are using an Xbox, make sure your Xbox is set to 720p or 1080p. 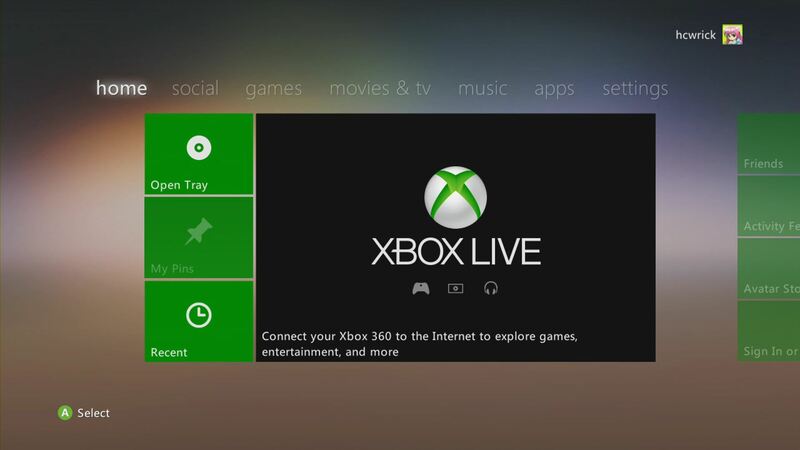 Some other Xbox video formats will give a black screen in Capture and your TV set. If you still do not see video on your TV set or on your PC screen, if you are using a PS3 you might need to reset the video mode on your PS3. To do this on the PS3 Slim, push the power button on the front until the light goes red. Then push and HOLD the button until you hear two beeps. Then you can release the power button and the PS3 video format will be set to the default. If you are using an Xbox, change your HDMI cable in case you have a broken wire inside the cable. Source: make sure your Hauppauge device is selected. Video Input: select HDMI if you are using a game console or PC with HDMI, or Component (YPrPb) if you are using a PS3. Most problems here are basic cabling and settings in game consoles. Check you cables! If you choose the wrong video source, you will get a black screen. For example, if you connect Component video but Arcsoft Capture is set for S-Video, you will get a black screen. Uncheck "hardware acceleration" in Capture. On some PCs, hardware acceleration will not work and you will see video on your TV set but not on your PC screen. If you are using a PS3, check to make sure the Red, Green and Blue cables are connected from the game console to the same color RCA connectors on the Hauppauge AV cable on HD PVR 2. Step 1: Check your USB cable and make sure the blue light is on on the front of HD PVR 2. Step 2: Check your video cables. Try removing each cable and make sure it is firmly reseated into each device you are using. Is the yellow light on on the front of HD PVR 2? If the yellow light is not on, then either you have the wrong Video input source set or your game console is not turned on. On the PS3, disconnect the HDMI cable between the PS3 and your TV set. Having HDMI connected at the same time as Component video will shut off Component Video and you will not see video in ShowBiz. On the PS3, if you left the HDMI cable connected by mistake, then once it is removed you need to reset the Video format. To do this on the PS3 Slim, push the power button on the front until the light goes red. Then push and HOLD the button until you hear two beeps. Then you can release the power button and the PS3 video format will be set to the default (480p plus AV out). Step 3: Once you have confirmed your video source is on, the Video input is correctly set and the yellow light is on the front of HD PVR 2, if you still see a black video screen in Arcsoft ShowBiz try capturing some video in the Capture module. If you can successfully playback a recording but you cannot see live video in the Preview window, there might be a video rendering problem (video card drivers, hardware acceleration…) Check device settings for video decoder details. To enable hardware acceleration, select "hardware acceleration" in ArcSoft ShowBiz Capture. If capture fails, it is likely something is wrong with the video input to HD PVR 2. This could be a broken or loose video cable or you plugged the cables into the wrong connector on HD PVR 2. Freeze in Hauppauge Capture: on the Xbox 360, in 'Display settings' there's a setting called 'Display Discovery'. 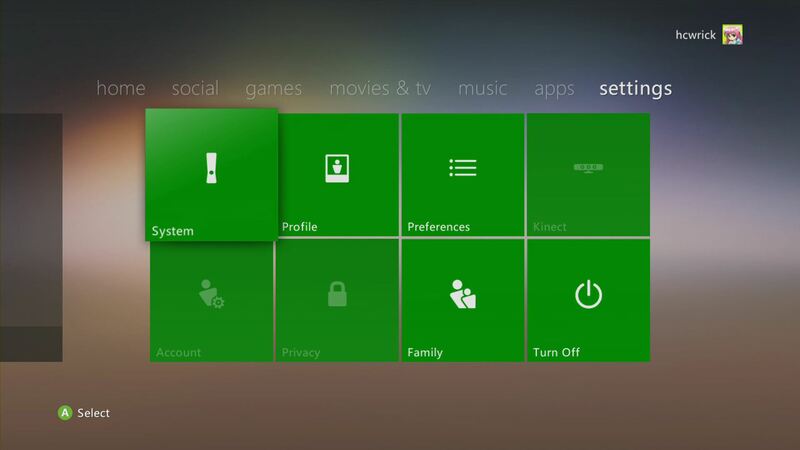 If you have it enabled, the Xbox automatically retrieves your TV's audio and video settings. 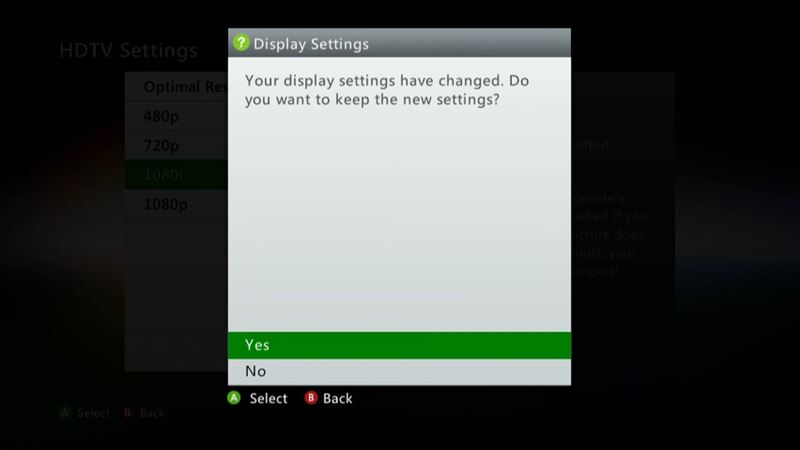 Doing this gives you the option to choose from several resolutions to be displayed, i.e. 1280x768 and 1360 x 768. Choosing one of these formats will cause HD PVR 2 to freeze. So only use 1080p or 720p. Freeze in Hauppauge Capture: in some PC systems, the audio Windows driver is an older version and needs to be upgraded to work with the Hauppauge Capture. Please go to your PC's manufacturers website and find an update to your sound system. Make sure you remove any HDMI cable connected to the PS3. If you do not disconnect the HDMI cable from your PS3, Component video will NOT be enabled and you will have a black screen in Capture. Your PS3 should now be set to Component video out and you should see video in the preview window in the Capture preview window. Plug the PS3 Component video cable that came with the HD PVR 2 into the AV connector on the back of your PS3. Then connect the colored RCA connectors (Red, Green, Blue video plus White and Red audio) of the PS3 Component video cable into the Hauppauge Component AV Cable adapter. The Hauppauge Component AV Cable adapter plugs into the back of the HD PVR 2 where it says AV in. To complete the installation, open Arcsoft Showbiz on your PC and click on Capture. This should open the Capture window. Make sure that the Hauppauge Siena Video Capture is selected in the Source dropdown menu. Now, from the Video Input drop down menu, select 'Component (YPbPr)'. If all goes well, you should see your PS3 video in the Capture preview window. If, however, you do not see video in the Capture window, you may have to go into your PS3's Display settings and change to Component video. If you have a PS3, you might need to reset the video on your PS3. To do this, push the Power button on the front of your PS3. It will turn red. Then, PUSH AND HOLD the power button until you hear the SECOND beep. The second beep means the video mode has been reset. You should now see video on your PC screen and on your TV set. Open ShowBiz and verify the correct Video input is selected. Video and audio input must be set initially for passthrough to work (if you power cycle the HD PVR 2, it may revert to its default setting and will need to be set again). Check that the HDMI cable from the HD PVR 2 (HDMI out) is connected to your TV monitor and the TV is set to the correct HDMI port if multiple are available on yourTV. Try changing the output resolution from your game console to 720p. Some TV monitors may not support all HDMI output resolutions. If using HDMI, verify your source device does not use HDCP copy protection (the PS3 uses HDCP on HDMI). If this is the case use the Component video input. If you are using a PS3, make sure your HDMI cable is not plugged in. PS3: Turn the PS3 off via the power button on the front of the unit. Flip the power switch on the back of the PS3 to the off position. Push and hold the power button on the front of the PS3 while you flip the power switch on the back of the PS3 to the on position. Once you hear the second beep, release the power button on the front of the PS3. Your PS3 video will be reset. Xbox: Remove any games from the optical drive. Turn the Xbox 360 off. Turn the Xbox back on via the controller. As the console starts, press and hold the Y button, and then pull the right trigger at the same time. Your Xbox video will be reset. The HD PVR 2 was designed to pass through any input to the HDMI output of the device. So whichever input you choose (composite, S-Video or Component) will be routed to the HDMI out. NOTE: if you are using composite or S-Video input, the HDMI video output will be standard definition even though you are using component cables. Note: There appear to be a number of HD PVR 2 users who are extending their USB cables because their computer is located a distance from HD PVR 2. This can potentially cause problems such as "no device detected" or a black screen in Showbiz Capture or bad video recordings. If you are using a long USB cable and are having problems, do an experiment and see if you problem goes away by connecting HD PVR 2 to your PC with the USB cable supplied with HD PVR . Next, check input make sure the video source setting is correct for your cabling. Do you see a valid resolution and bit rate for source? Try changing the resolution of the source .. Most problems here are basic cabling and settings in game consoles. Also, if you choose the wrong video source in Arcosft Showbiz, you will get a black screen. For example, if you connect Component video but Arcsoft Capture is set for S-Video, you will get a black screen. Check and make sure the Red, Green and Blue cables are connected from the game console to the A/V Input on HD PVR 2. Pass through problems, such as a black screen on your TV set (even though you can record videos), are usually basic cabling and settings in Showbiz. Check your cables! If all input and pass through connections are correct and pass through is still not working, check your HD TV for correct input source. If input is correct, try changing input resolution of source to HDPVR 2. If you have stutter in your preview window, check that system specs meet the minimum required. This is not a fatal problem since the HD PVR 2 will make good recordings even if the preview window slows down.